Sometimes the hardest thing about writing and preparing for DOTW is simply picking out the drink. 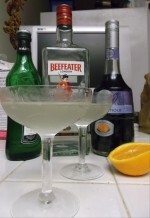 I can spend, it seems, many hours online trolling for a cocktail that won’t take hours to make and where I won’t have to spend an arm and a leg buying several expensive ingredients I barely have room for at stately DOTW Manor. So, I alway love it when some cool person suggests a possible mixed drink or cocktail (people I read keep telling me there’s a difference) for me to try. In fact, if anybody would like to come up with a suggestion for a drink that hasn’t been featured before in comments or e-mail, I promise to give it a fair hearing. In this case, the cool person suggesting the drink was the highly esteemed Christopher Tafoya, Facebook friend, mutual real life friend with other real life friends, and cocktail enthusiast. Christopher provided an interesting find that’s forcing me to diverge from orthodoxy just a bit, while only forcing me to purchase one very interesting and odd new ingredient. It’s also got a name with just enough of a touch of science fiction to it to make it semi-appropriate for the week of Comic-Con. That’s where I’ll be by the time you read this, and also the reason this series will be taking a break next week. Anyhow, here’s this week’s cosmic selection. This one’s as easy to make as they come. Combine the ingredients in a cocktail shaker. Shake. Strain into a cocktail glass. Sip, preferably while listening to the music of the spheres or at least Richard or Johan Strauss. Remember when I implied my take was a bit heretical? Well, credit for the revival of the Jupiter in recent years goes mainly to the revered Ted Haigh, author of Vintage Spirits and Forgotten Cocktails, who picked the drink out from a number of older tomes. He, however, declared that it was the one drink in his entire book requiring the most precision. Depart by even the difference between a measuring teaspoon and a dining teaspoon and, as far as Haigh is concerned, the drink is mostly done for. Part of the reason for that is Parfait Amour. This somewhat obscure and not too easily found liqueur, extracted from exotic oranges and vanilla pods, is both very sweet and very purple. It also gives the Jupiter it’s slightly grey, otherworldly hue. I can’t disagree with Haigh that a little goes a long way, but I’d like just a little more, proportionally speaking. So, when Mr. Tafoya let me know that a slightly different recipe existed — I’d looked in a number of places and had seen exactly the same recipe he first gave me — I had to give the alternative version a try. What a shock that it turned out to be, to my taste buds, quite a bit better. Basically, I found that a quarter of an ounce less vermouth made for what I found to be a brighter, more enjoyable beverage. So, dear readers, I’m giving you a choice: 1/2 or 3/4 ounce of dry vermouth. Which drink would the evolved Dave Bowman choose? See you in two weeks, star children.